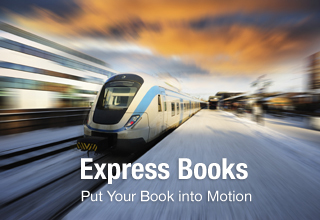 Today we announced the introduction of Express Books™, which gives academics the chance to bypass traditional routes and publish entire works to be distributed through our parent company SharedBook's e-commerce system. Imagine being able to keep your own copyright, being able to choose the size of your book, the cover of your book, and holding on to 100% of the royalties you've earned. And further, imagine getting a direct link and button that you can put on any web page and have students, other academics, or even the general public purchase your book. That's Express Books. Interested? Fill out this form and a representative will be in touch with you shortly. Press Release below the fold. New York, NY, July 25, 2013 - AcademicPub™, the world’s largest provider of copyright-cleared content for digital and printed course packs in higher education, today announced the launch of Express Books™, enabling professors to self - publish. The announcement was made by Caroline Vanderlip, CEO, of AcademicPub parent SharedBook Inc.
As Express Books authors, instructors can now publish and sell their own books to the education and mass market on any web site by utilizing Sharedbook’s e-commerce and fulfillment platform and distribution capabilities. Express Books content will also be available as excerpts through the Academic Pub Scholar Collection™ for selection by other instructors in their custom course packs. Authors have the ability to make their book available for adoption worldwide, price it as they choose, retain control over the copyright and update the content at any time. Plus, authors receive 100% of royalties earned on all books sold. "Not only is Express Books perfect for the instructor who has been developing and using his or her own work in course packs, this new feature greatly expands the AcademicPub custom book capability overall," said Vanderlip. "Previously, most of our custom books have been built containing content from a myriad of providers and formats. Now, through Express Books, these custom books created by a single professor can be used as is by other instructors for their own classroom use, at a fraction of the price of more traditional textbooks." Vanderlip added: "All of this customization is possible thanks to the core SharedBook technology platform developed over the last decade -- one that has incredible flexibility for the creation of personalized books, customized books and custom textbooks." Headquartered in New York with R&D in Herzlia, Israel, SharedBook enables users to dynamically produce personalized and customized books and documents with its patented publishing and compilation platform. AcademicPub adapts the SharedBook platform for the purpose of enabling educators and institutions to create course materials quickly, easily, and with greater access to content than previously possible, all in just minutes.